On the 17th of March 2018 Pope Francis went on pilgrimage to the sites associated with Saint Pio of Pitrelcina. A few days ago the Pope wrote to the Capuchin Minister General Br Mauro in thanksgiving for the life and example of St Pio. In the letter the Pope reaffirms his commitment to create a ‘church that is poor and for the poor’ and calls on each of us to create a radical culture of gratitude that stands in contrast to today’s ‘throwaway culture’. As always the Pope asks for our prayers. In the month dedicated to our blessed mother, let us renew our prayer for Pope Francis and his mission. I still have before my eyes and in my heart the encounters St. Pio held out to me during the unforgettable day I experienced at Pietrelcina and San Giovanni Rotondo. To my thanks for this priceless gift I add also my gratitude for the good wishes that you—also in the name of the whole Franciscan family—offered to me, together with the gesture of charity that I immediately set apart for the many needy brothers and sisters who knock at my door. In a world that engenders a throwaway culture, a culture of indifference, I will not desist in wanting a Church that is poor and for the poor. This is not a liberal agenda, but something radical because it’s about a return to the roots. Going back to the origins is not a withdrawal into the past but the strength for a courageous beginning turned toward the future. The works of mercy that happen by means of countless, simple, everyday gestures, awake in us the authentic revolution of divine tenderness. 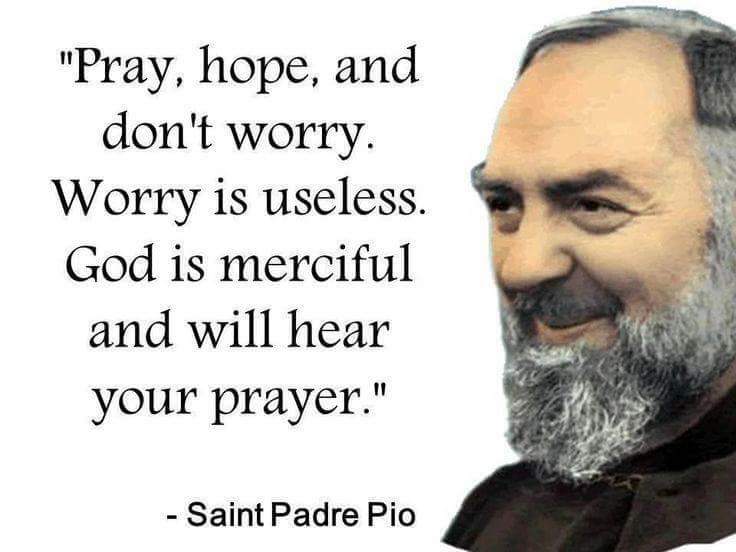 May St. Pio of Pietrelcina, who has left us his own example of an existence burning with the desire to impart the life of God to his brothers and sisters, obtain that grace for us as well, that we might be consumed by that same fire and guided by that same charity. Invoking the intercession of the Mother of God and of St. Francis of Assisi, I bless you and your confreres from the heart, together with the hope that Easter becomes a renewed proclamation that the world is not meant to come to nothing, but rather is destined for transfiguration in God, who is the worthy end, unrivaled and true, of the human person.